Fire (火, Hi) natured chakra allows for Fire Release (火遁, Katon), which is strong against Wind but weak against Water. Wind (風, Kaze) natured chakra allows for Wind Release (風遁, Fūton), which is strong against Lightning but weak against Fire. Lightning (雷, Kaminari) natured chakra allows for Lightning Release (雷遁, Raiton), which is strong against Earth but weak against Wind. Earth (土, Tsuchi) natured chakra allows for Earth Release (土遁, Doton), which is strong against Water but weak against Lightning. Water (水, Mizu) natured chakra allows for Water Release (水遁, Suiton), which is strong against Fire but weak against Earth. Basically, this means that if an elemental technique is put against another elemental technique of the same level, but of a stronger nature, then the technique with the superior nature will prevail. However, a technique with a weaker nature can overpower a technique with a stronger nature if the former is of a higher level, for example a technique that employs only Water Release cannot extinguish a wind-enhanced fire technique, as seen when Kakashi attempted to douse Kakuzu's combined fire and wind release technique with the Water Release: Water Encampment Wall to no avail, it was however countered with a combination of water and wind: Typhoon Water Vortex Technique. For relationships between chakra natures, there is a principle known as counterbalancing (相殺, Sōsai). This principle states that two techniques of the same nature would cancel each other out if the same amount of chakra was put into them. For example, in Kakashi's fight with Kakuzu, he was able to cancel Kakuzu's Lightning Release: False Darkness by deflecting it with his own technique, the Lightning Cutter. However, if one of the techniques had more chakra put into it, it would overcome the other technique. Not only that, but the stronger technique would absorb the weaker one, and the user of the weaker technique would receive more damage than the original amount, as he will have added to the technique. For example, in Sasuke's fight with Itachi, they both use the Fire Release: Great Fireball Technique against each other, and Sasuke's technique begins to overwhelm Itachi's as he activates his Cursed Seal of Heaven. Itachi would have been hit by both his own technique as well as Sasuke's. Itachi responds to this by using Amaterasu, the highest level Fire Release technique, which absorbs all the fire previously created by the two techniques, growing into a large mass of black flames. Besides the five basic nature types, there are several more advanced types. By initiating more than one basic chakra nature transformation simultaneously, one can create a completely new nature of chakra with unique properties, and is referred to as a "elementally-recomposed nature type". Doing this requires a special ability and such abilities are rarely seen outside a kekkei genkai or kekkei tōta. The Ice (氷, Kōri) nature, used by Haku and the Yuki clan, is created by simultaneously combining the Water and Wind natures. This nature allows for the use of Ice Release (氷遁, Hyōton) ninjutsu. Used through a kekkei genkai. Yukigakure-nin were able to use a different kind of Ice Release, by drawing on already-existing ice, snow, and cold. This was not a kekkei genkai, as Kakashi could copy one of these techniques with his Sharingan. This is likely a mistake, as the kekkei genkai of the Yuki clan had not been referred to as "Ice Release" yet at that time, and also the details of Nature Transformation hadn't been revealed yet, allowing the creators of Naruto the Movie: Ninja Clash in the Land of Snow to "invent" this "new" nature. Also, while Haku's Ice techniques had unusual effects, this type of Ice Release focuses on more obvious effects of ice, such as freezing. The Wood (木, Ki) nature, used by Hashirama Senju, Yamato, Danzō Shimura, Madara Uchiha and Zetsu, is created by simultaneously combining the Earth and Water natures. This nature allows for the use of Wood Release (木遁, Mokuton) ninjutsu. Used through a kekkei genkai. The Lava (溶岩, Yōgan) nature, used by the Four-Tails and its jinchūriki Rōshi, as well as Mei Terumī, Kurotsuchi and Dodai, is created by simultaneously combining the Fire and Earth natures. This nature allows for the use of Lava Release (熔遁; 溶遁, Yōton). The Four-Tails and Rōshi used it through a Tailed Beast Skill, while Mei, Kurotsuchi and Dodai used it through a kekkei genkai. It is implied that the two ways of writing this nature (熔遁; 溶遁) are pointing out that they are different in some way. They are switched around and alternated throughout the plot, with Iwagakure and Kumogakure characters using the kanji "熔" and the Kirigakure character using the kanji "溶". However, the true purpose of this difference is unknown. The Blaze (炎, Honō) nature, used by Sasuke Uchiha, originates from the flames of Amaterasu and allows the use of Blaze Release (炎遁, Enton) ninjutsu. It is unknown what this nature entails. (嵐, Arashi) nature, used by Darui and stolen by Hiruko, is created by simultaneously combining the Lightning and Water natures. This nature allows for the use of Storm Release (嵐遁, Ranton) ninjutsu. Used through a kekkei genkai. It is likely that the two users were using a different type of this release, as Hiruko is a character only seen in Naruto Shippūden 3: Inheritors of the Will of Fire, and Darui hadn't been introduced at that time. There is also a significant difference between the techniques of this nature they use. The Boil (沸騰, Futtō) nature, used by Mei Terumī, is created by simultaneously combining the Water and Fire natures. This nature allows for the use of Boil Release (沸遁, Futton) ninjutsu. Used through a kekkei genkai. (塵, Chiri) nature, used by Ōnoki and Mū, created by simultaneously combining the Fire, Earth and Wind natures. This nature allows for the use of Dust Release (塵遁, Jinton) ninjutsu. Used through a kekkei tōta. The Explosion (爆発, Bakuhatsu) nature, used by Gari and Deidara, allows for the use of Explosion Release (爆遁, Bakuton) ninjutsu. It is unknown what this nature entails. Used through a kekkei genkai. This kinjutsu that was passed down in Iwagakure allows the user to knead chakra into materials. It is likely that the mouths on the user's palms and chest are a direct result of using this technique. Deidara stole this technique in his quest to find the ultimate art. He used it in conjunction with his Explosion Release to infuse explosive chakra into clay, creating his Explosive Clay. The Scorch (灼熱, Shakunetsu) nature, used by Pakura, allows for the use of Scorch Release (灼遁, Shakuton) ninjutsu. It is unknown what this nature entails. Used through a kekkei genkai. The Magnetism (磁力, Jiryoku) nature, used by Toroi, the Third and Fourth Kazekage, allows for the use of Magnet Release (磁遁, Jiton) ninjutsu. It is unknown what this nature entails. Used through a kekkei genkai. 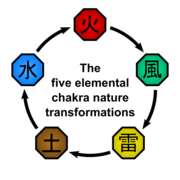 Aside from the five basic types of nature transformation, there is also a sixth type: the Yin (陰, In), the basis of imagination and spiritual energy, used to perform Yin Release (陰遁, Inton); and the Yang (陽, Yō), the basis of vitality and physical energy, used to perform Yang Release (陽遁, Yōton). Together, they are used to perform Yin–Yang Release (陰陽遁, Onmyōton). Yamato implied that the Yin and Yang are the source of non-elemental jutsu such as the Shadow Imitation Technique, Multi-Size Technique, medical ninjutsu, genjutsu, etc. The transformation of the Yin and Yang has to do with altering the amounts of and balance between spiritual and physical energy in chakra. As explained by Shikamaru Nara, Tayuya's spirit worms were forms of spiritual energy that have small amounts of physical energy, thus they require stability and feed upon the physical energy they lack. Shikamaru also mentioned that Tayuya was the same type of ninja as he is, being able to use such kinds of "special chakra" in battle, supporting the belief that the Nara clan's shadow-based jutsu is also Yin and Yang-based. The Yang Release (陽遁, Yōton; Viz "Light Style") techniques, based on the physical energy that governs vitality, can be used to breathe life into form. 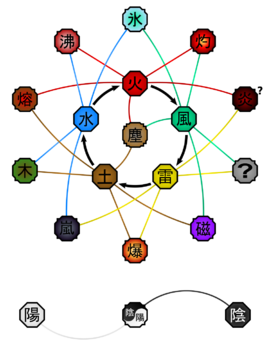 During the Nine-Tailed Demon Fox's attack on Konoha, Minato Namikaze used the Eight Trigrams Sealing Style to seal the Yang half of the beast's chakra, within Naruto Uzumaki. Whenever Naruto is in Nine-Tails Chakra Mode, Wood Release techniques will react to the Yang chakra's life-giving properties and mature into full-grown trees within a matter of seconds, either by contact or close range. This was also shown to have the same effect on White Zetsu Army clones, whose genetic make-up is similar to that of plants. When combined with Yin Release, it allows the use of Yin–Yang Release. The Yin Release (陰遁, Inton; Viz "Dark Style") techniques, based on the spiritual energy that governs the imagination, can be used to create form out of nothingness. During the Nine-Tailed Demon Fox's attack on Konoha, Minato Namikaze used the Dead Demon Consuming Seal to seal the Yin half of its chakra within the death god. When combined with Yang Release, it allows the use of Yin–Yang Release. According to the Second Mizukage, genjutsu fittingly falls under the broad category of Yin Release. The Yin–Yang Release (陰陽遁, Onmyōton) techniques make simultaneous use of Yin Release and Yang Release. Yin relates to one's spiritual energy and Yang relates to one's physical energy and it's necessary to utilise both of these in order to mould chakra for ninjutsu. According to Yamato, the manipulation of Yin and Yang is the source of non-elemental techniques such as the Shadow Imitation Technique, Multi-Size Technique, medical ninjutsu, genjutsu, etc. The Sage of the Six Paths had such a mastery over the Yin–Yang Release that he used Yin to make his dreams take form, and then used Yang to make his fantasies real. He could even make them come to life. According to Tobi, the Sage's ability was called Creation of All Things (万物創造, Banbutsu Sōzō), which he employed to create the tailed beasts out of the chakra from the Ten-Tails. The technique Izanagi is based on this ability. Nagato also had mastery of the Yin–Yang Release, as well as the other elemental releases by age 10.